It is no surprise that Francis Ngannou, who had to do a lot of manual labor while growing up, is today packing a punching power of 129,161 units, the highest ever recorded by the UFC. The Cameroon-born French professional mixed martial artist is making a name for himself in the MMA world, thanks to his perfect combination of size, strength, and speed which has proved unmanageable by a number of his opponents. The heavyweight division fighter will need to gain plaudits in the coming year after having slipped up recently. Regardless of what the future holds, his win against Alistair Overeem will ensure he remains in the highlight reel for years to come. On the 5th of September, 1986, in the village of Batie, Cameroon, Francis Ngannou was welcomed to the world. The identity of his parents are not known but it is reported that his father was a notorious street fighter. Ngannou was raised in poverty and because of this, he received very little education while growing up. At around the age of 12, Ngannou found work in a sand quarry. He did that among many other jobs to make ends meet before he was able to look to boxing as a way out. As the story goes, Ngannou was about 22 years of age when he reportedly began to train as a boxer despite objections from his family. He trained for a year before stepping away from the sport due to illness. It took him four years before he was able to return to boxing, this time, however, he emigrated to Paris, France in order to get better opportunities. 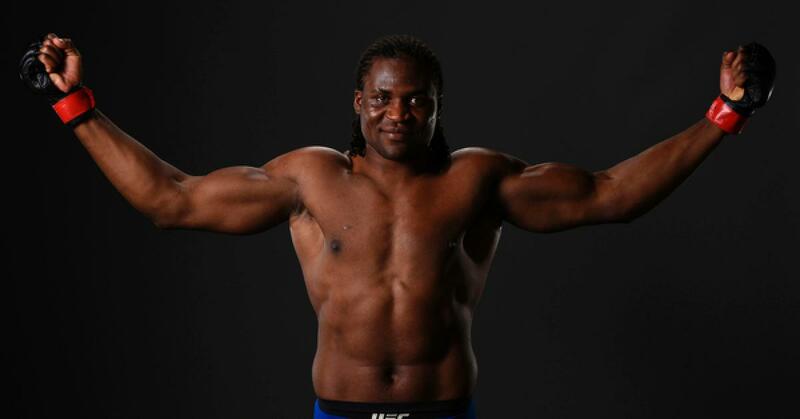 Francis Ngannou was a homeless 27-year-old man in Paris when began training for free under coach Didier Carmont. Being a fan of the legendary Mike Tyson, Ngannou had hoped to someday dominate heavyweight boxing just like his hero did. That did not turn out to be as Ngannou was introduced to mixed martial arts by his coach and he never looked back. Ngannou fought all across Europe under different promotions, amassing a 5-1 record before getting the opportunity to make his Ultimate Fighting Championship (UFC) debut in December 2015 against newcomer Luis Henrique who he knocked out with a punch in the second round. Ngannou then went on to beat other newcomers Curtis Blaydes and Bojan Mihajlović via Technical Knockout as his stock began to rise in the sport. The Cameroonian-born fighter’s first challenging opposition came in the shape of Anthony Hamilton at UFC Fight Night 102. Hamilton did not prove to be much of a test at the end of the day as he won the fight in the first round via submission and received the Performance of the Night bonus for his efforts. Ngannou again received the Performance of the Night bonus in his next fight against Andrei Arlovski who he beat in the first round via TKO. He then went ahead to pull off a surprise first-round knockout victory against Alistair Overeem which earned him the ESPN, Bleacher Report, and MMA Fighting website 2017 Knockout of the Year award. Francis Ngannou’s next bout was for the UFC Heavyweight title. He lined up against American Stipe Miocic who dominated him and gave him his first UFC defeat via unanimous decision. Ngannou again suffered defeat against Derrick Lewis at UFC 226 in what was dubbed the worst heavyweight fight of all time. Francis Ngannou’s net worth is estimated to be around $350,000. The fighter, who is known for his raw power, deceptive mobility and athleticism, made his money through the salary and bonuses he collects from fighting under the UFC promotion. Ngannou looks to be putting his earnings to good use as he is reportedly building an MMA gym in his birth country in order to give more children a chance to make something out of their lives as he managed. Francis Ngannou has a very impressive height of 6 feet 4 inches or 1.93 m. He is among the taller fighters in the heavyweight division of mixed martial arts where the average height is 6 feet 2.5 inches. He is however way well of the tallest person in the division, Stefan Struve, who is 6 feet 11.5 inches or 2.13 m. Ngannou further weighs 253 pounds or 115 kg and has a reach of 83 inches or 211 cm.